QUEZON CITY – Two Augustinian Recollect religious of the Province of St. Ezekiel Moreno participated in the Asia-Pacific Augustinian Conference (APAC) Convention held in Ho Chi Minh City, Vietnam last November 9-11, 2018. Currently, there are 11 countries that are members of the so-called “APAC nations”: Australia, China, India, Indonesia, Japan, Korea, New Zealand, Thailand, Tonga, Vietnam and the Philippines. The goals of the Conference itself include: meeting the need for close communication at all levels, fostering relations and developing forms of assistance among all the members; promoting projects at regional, national and international levels; promoting vocations to the Augustinian family, better formation of candidates, ongoing formation and Augustinian spirituality; and increasing common awareness of the values, needs and aspirations of the people of Asia and of the Pacific, especially the poor and the young, and developing new models of evangelization. The end of World War II stoked the start of the decolonization movement which paved the way to the split of the country into two regions: the North and the South. The Catholic Church in the North became the silent Church under the Iron Curtain while the one in the South enjoyed freedom in doing evangelization and charitable works such as those in the schools, orphanages, and nursing homes for the elderly. At the end of Vietnam War on April 1975, the Church in the South suffered the same harsh policies from the State. In 1978, the Catholic Bishops Conference of Vietnam opted for the way that best fit the people of God: “That Catholics should collaborate with the State policies in what is not against the faith, ‘living the Gospel among the beloved people of Vietnam’.” In this way, the Church was construed as renewing Herself with the Vatican’s “Gaudium et Spes” (literally, “Joy and Hope”), a Pastoral Constitution on the Church in the Modern World, promulgated in 1965. With these, some crucial steps that were quite favorable particularly to the Catholic Church included, among others: the lifting of restrictions on priestly ordination (although not completely yet since a Police Clearance is required for ordination), and of congregations’ admission of young candidates; granting of permits for church constructions; allowing female congregations to operate Kindergarten, etc. Furthermore, Vietnam, which covers 331,699 sq. km, has a population of 96,279,392 (as of 2017) of whom 6,812,954 (or 7.1%) are Catholics. The Catholic Church in Vietnam is divided into 26 dioceses. In the Archdiocese of Sai Gon alone (as of August 2018), there are 218 religious congregations, 23 secular institutes, 16 societies, and two associations. Several key areas were noted as challenges in relation to religious life. From a wider perspective, there is the negative impact left behind by the indoctrination of Marxist ideology. The “dishonest environment” in which telling lies, for instance, is not considered a grave sin, affects the psychological and spiritual growth especially of the young. And there, too, is the issue of motivation, whether authentic or not, of candidates, which cannot just be known easily within a short period of interaction with them. The country’s surging economy, moreover, is creating consumeristic mentality and comfortable lifestyle which are factors that, as in other countries, impinge on consecrated persons. The spirit of mission “intra gentes” (especially because 93% of the country’s population are non-Christians) is weak. “Fidelity is also a challenge because it is being shaken by the fragmented and transient nature of today’s disoriented society,” added the report. As to the question: “How to begin fishing for vocations in Vietnam?” several tips were shared to the Convention participants and foremost among them were: Make contacts with some Church leaders in Vietnam and know better the situation, and link with the (parish) priests or religious to assist you in initiating contacts with the locals. 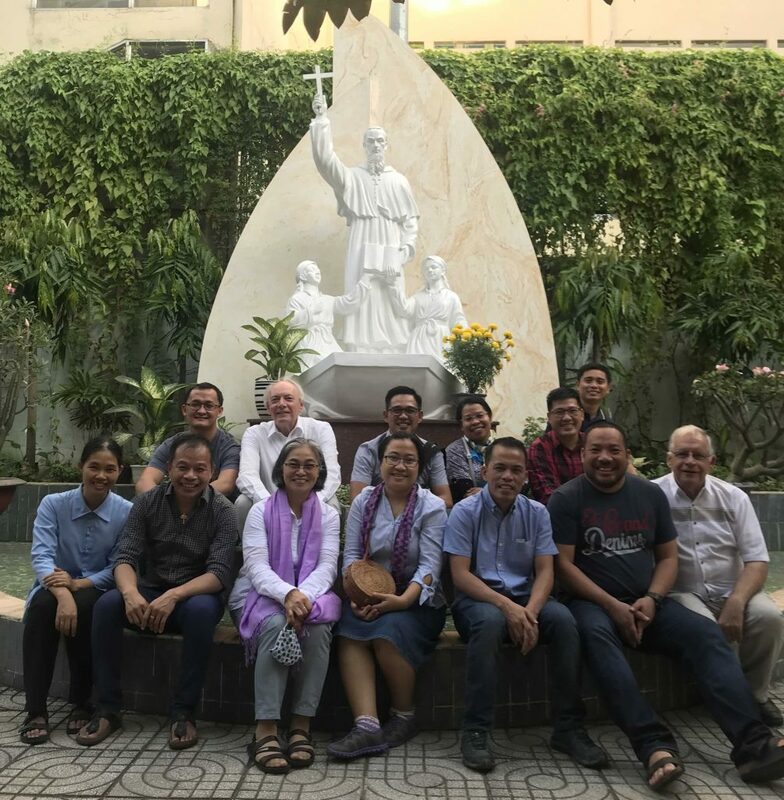 With the theme “Augustinians on Common Mission in Vietnam,” the Convention held in the business capital city of Ho Chi Minh was already the 14th since APAC was born on September 13, 1977. The earlier Conventions took place in the following venues: Manila, Philippines (1980, 1984, 1987, 1990); Nagasaki, Japan (1993); Iloilo City, Philippines (1996); Sydney, Australia (1999); Cebu, Philippines (2002); Incheon, Korea (2005); Tagaytay City, Philippines (2008); Novaliches, Philippines (2012); Kalimantan, Indonesia (2014); and Cebu, Philippines (2017). This year’s Convention was participated in by five (5) religious institutes within the Augustinian Family, to wit: Order of St. Augustine (OSA) of Sto. Niño de Cebu, Australia, Vicariate of the Orient; Augustinians of the Assumption (AA), Augustinian Missionaries of the Philippines (AMP), Augustinian Sisters of the Divine Mercy (of Ketapang, Indonesia), Augustinian Sisters of Our Lady of Consolation (ASOLC), and Order of Augustinian Recollects (OAR).